Mariah Point is located on the north side of the Royal Gorge in the Tahoe National forest (39°15’53.30″N, 120°23’42.87″W) and affords a spectacular view of the gorge as well as the east rim of the mountain ridge from Lincoln to Granite Chief. The access trails to the point cross through both National Forest and land owned by Truckee-Donner Land Trust. The trails out to the point are marked ski trails used by Royal Gorge and in the summer the trails are used by hikers and mountain bikers. If you are skiing this trail you must have a valid Royal Gorge trail pass. The map below shows the 6 mile loop that makes up the hike and it can be accessed at numerous places on the west and south sides of Serene Lakes. The loop can be done in either direction although mountain bikers might want to consider the clockwise direction as discussed below. During early summer a variety of native wildflowers start blooming along the trail and continue into August. An occasional Black-tailed deer may also be observed as well as signs of Black Bear. The bear are especially active in late summer when the numerous berry bushes are covered with plump red berries. Trail Description:This description is for the hike done in the clockwise direction. Much of the trail is marked with Royal Gorge ski trail signs and will be referred to in this description. This guide describes the start from the trailhead in Serena Creek gorge on Soda Springs Rd, but it can be started anywhere on the west side of Serene Lakes. Starting at the trailhead (see map below), walk up the road about 50 yds to the trail entrance on the east side of the road. Proceed down the road and over the old bridge over Serena Creek. Follow the trail (marked as Sterling Canyon ski trail) south as it winds above Serena Creek gorge for about a mile and a half. Make sure to bear left at the junction with the Whitney’s Bowl trail at about the 1 mile point. The ski trail turns to the west near the Hellman’s warming hut, but you want to continue south through the trees to pick up the single track trail that runs out to the point. The trail goes straight along the ridge for a couple of hundred yards and then winds through the forest until it arrives at the rocky point overlooking the Royal Gorge. Once you have reached the point and taken in the view of the Soda Springs basin to the east and the Royal Gorge to the west, make sure you look for a granite boulder about 50 yards down to the right of the fallen tree at the point. 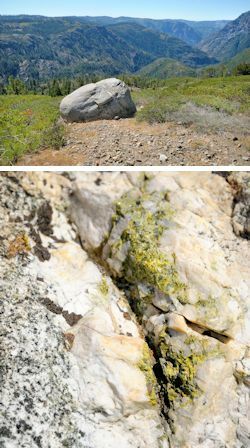 If you examine the boulder on the Royal Gorge side you will see a small deposit of Malachite Green embedded in a quartz vein in the rock. After you have enjoyed the scenic beauty of the point, retrace your steps to the warming hut. At this point you have two options. You can return on the trail you came in on along Serena Creek gorge or you can make a loop on the Hellman’s Way ski trail back through Castle Pass. Be forewarned that the loop trail is about a mile longer than the Serena Creek trail and there is a long steady climb up to Castle Pass that can be very warm on a sunny day. The loop trail does afford great views of the Palisade basin and Devil’s Peak. If you want to return on the loop trail proceed north from the warming hut up the Hellman’s Way ski trail. Follow the trail north along the ridge line. Bear left at the junction with the Sterling’s Canyon trail. The trail drops down for about a mile until it reaches the beautiful Palisades Creek meadow where wildflowers abound for much of the summer. There is a trail that heads to the west in the middle of the meadow that goes down to some Indian petroglyphs. I strongly recommend that you do not try this trail unless you know where the petroglyphs are. They are very hard to find and the trail goes down quite a ways which means coming back is a long uphill slog. To get up to Castle Pass, continue north out of the meadow and follow the trail as it climbs through a shady stretch of forest. As you climb out of the forest follow the unmarked trail that goes up to the right towards Castle Pass. When you reach the top of the pass the trail drops back down into the forest of the Serene Lakes basin. At the bottom of the hill bear to the right on the Half Hitch ski trail. Follow that for about 100 yds until it intersects with the Reindeer Ski trail. Turn right on the Reindeer trail and follow it as it winds south along the west side of the Serene Lakes community. Once you have passed where the trail overlooks the lakes, bear right on the Sunny Side ski trail. This will take you down a steep hill to the junction with the Sterling’s Canyon trail that you came in on. At the bottom of the Sunnyside hill turn left and follow the trail back out to Soda Springs Rd. The more technical mountain bikers might want to try the single track trail that has been created by the Truckee Donner Land Trust as part of the Royal Gorge Rim Trail. The trail use a series of switchbacks to climb to the top of East Ridge to get out to the Hellman Warming Hut (see the black route on the map). It’s a pretty tough climb and the switchbacks are challenging. For more information about these single track trails see the Mountain Bike Trails map at this link.